Gutmann products are easy to clean. All you need is washing-up liquid or a neutral liquid detergent and a soft sponge or cloth. The detergent must not contain any aggressive/corrosive chemicals, abrasives or wax, as such products can affect the surface coating. Limescale can be easily removed simply by rubbing the surface with a cleaning agent and buffing the affected area. The maximum temperature of the water must not exceed 60°C. Always adjust the water temperature from cold to warm. Buloxiet is an artificial marble composite blend that was developed by Bart Buyse. Buloxiet consists of two coating layers filled with various composite blends that guarantee enhanced heat deformation resistance and excellent resistance to water load and the effects of chemical stress. The composite blend is filled with selected types of quartz and marble as well as glass reinforcement materials. The resulting product is much more robust than other varieties of artificial marble. Buloxiet has excellent thermal insulation properties, making it ideal for bathtubs. Also ,it has a low specific weight (1.25 kg/litre) whereas the specific weight used for other artificial marble units is 2.5 to 2.8 kg/litre. This is important for freely suspended units because much lighter products can be made with Buloxiet. Standard countertops made of artificial marble (dimensions 140 x 60) weigh up to 75 kg, whereas the same product made of Buloxiet weighs only 30-35 kg. Buloxiet products are therefore easier to handle and install. The hardening and post-curing of Buloxiet take place on the mould. As a result, the process is dimensionally accurate with no large deviations (approx. 1 mm per 1.40 m). Buloxiet has no fillers that affect the contact surface, which cannot be said of various full-casting processes. 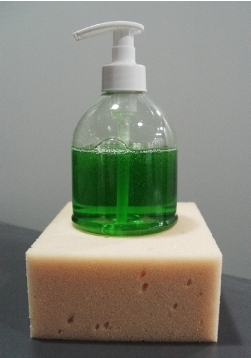 As a result, when Buloxiet is used it is not possible for chemical substances (soap, etc.) to contaminate the surface through absorption. Instead, Buloxiet has a closed-pore surface that is resistant to many chemical substances such as alkalis and acids, making it very easy to maintain.